Growing up, Pecan Sandies were some of my favorite cookies. Though I loved sweets (like most kids do), my love for Pecan Sandies always surprised me given they weren't filled with chocolate. 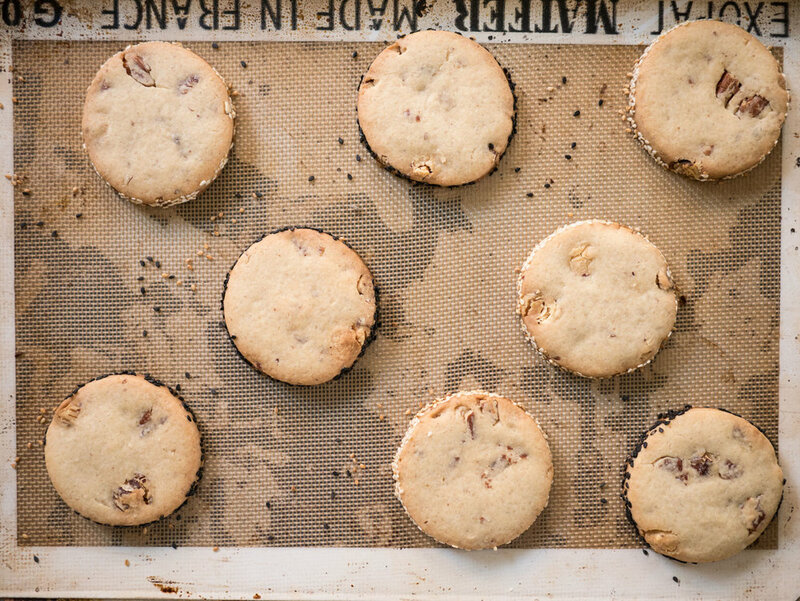 That love of shortbread continues to this day and these cookies combine hazelnuts, pecans and almond extract for a nutty texture and flavor. The additional of maple syrup makes it the perfect cozy winter cookie. Pre-heat the oven to 350 degrees. Combine butter, sugar and maple syrup in a mixer. Once fully mixed, add the extracts and then the dry ingredients. Once combined, add the nuts. Shape the dough into a disk, wrap in plastic and stick in the fridge for 20-30 minutes. Once the dough is rested, pull out and roll into a 1/4 inch slab. These cookies do not spread at all, so you can roll thicker or thinner depending on your preference- what you roll is the end thickness of your cookie. I used a mason jar lid ring as a cookie cutter but you can use whatever shape you like, or cut into squares. I then rolled the edges in sesame seeds for an additional nutty crunch, but that is optional. Other finishing ideas: sprinkle with sea salt or turbinado sugar. Bake for 15-20 minutes (shorter for a thinner cookie - longer for a thicker cookie). Look for the edges to begin to brown and then pull them out of the oven and cool on a wire rack for at least 15 minutes.